Indian Prime Minister Narendra Modi and Russian President Vladmir Putin are expected to sign a deal in New Delhi this week for Moscow to supply S-400 air defense missile systems at a cost of over $5 billion, despite the threat of U.S. sanctions. The two countries have been negotiating the deal since 2015. 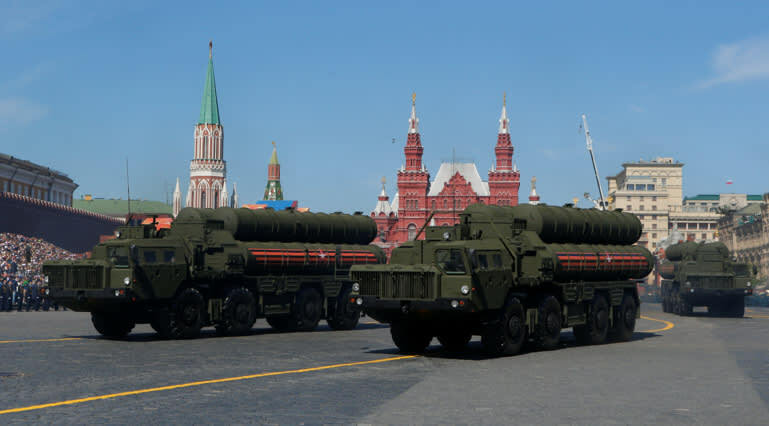 The purchase of five S-400 Triumf missile systems and associated equipment is expected to boost India's defense capability along its borders with nuclear-armed Pakistan and China. The S-400 is Russia's most-advanced long-range surface-to-air missile system and is planned for induction in the Indian Air Force by 2022. "The theme of military-technical cooperation will be on the agenda," said Russian spokesperson for the president Dmitry Peskov on Monday, according to Russian news agency TASS. "A package of agreements is to be signed." A day after Peskov's remark, Putin's top foreign policy aide Yuri Ushakov was quoted by media as saying in Moscow that the Russian president will oversee the signing of the S-400 deal during his visit. The S-400 Triumf, which NATO calls SA-21 Growler, is a mobile multichannel air defense missile system. It entered service of the Russian army in 2007 and is capable of engaging all types of aerial targets including aircraft, unmanned aerial vehicles, and ballistic and cruise missiles within a range of 400 km, at an altitude of up to 30 km. China also bought this advanced missile system from Russia this year following a purchase of Su-35 combat aircraft in late 2017. Those purchases prompted the U.S. to impose sanctions on Beijing last month for violating the so-called "Countering America's Adversaries Through Sanctions Act" which decrees economic bans on those importing Russian military hardware. The administration of U.S. President Donald Trump has warned countries planning to buy S-400 and other Russian defense equipment of similar action. "We hope that at least this step [sanctions on China] will send a signal of our seriousness and perhaps encourage others to think twice about their own engagement with the Russian defense and intelligence sectors," the U.S. State Department said on Sept. 20. 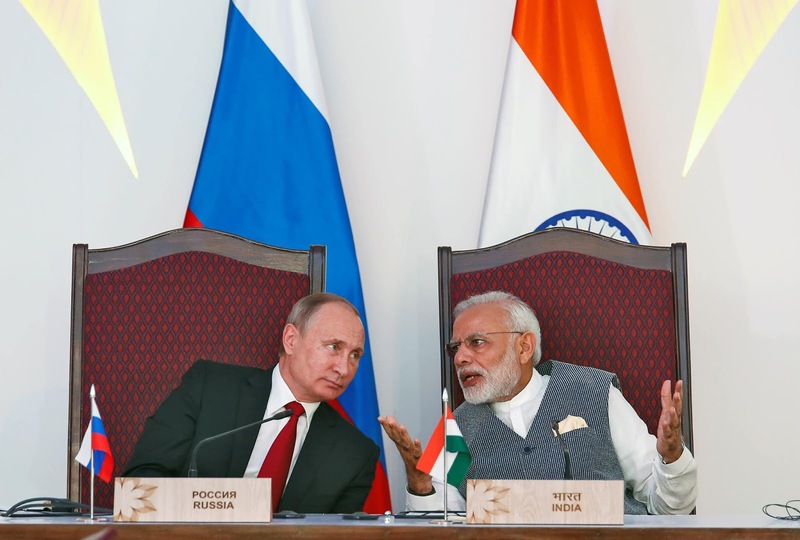 New Delhi -- which has a 70-year history of procuring military hardware from Russia from where it gets 60% of its defense equipment -- is hoping to get a waiver from the U.S. for the S-400 deal. After Russia, the U.S. is India's largest arms supplier. In early September, U.S. and Indian defense and foreign ministers met in New Delhi for their "2+2" talks. U.S. Secretary of State Mike Pompeo said then: "We do understand the history, right, of India's relationship with Russia and legacy systems." "Our effort here, too, is not to penalize great strategic partners like India, a major defense partner. The sanctions aren't intended to adversely impact countries like India. They are intended to ... have an impact on the sanctioned country, which is Russia," he said. The Indian Air Force sees the S-400 Triumf as "an absolute necessity and part of its offensive-defense strategy of maintaining a credible deterrence along two fronts with China and Pakistan," according to a report in India Today. Its Tombstone radar can sense up to 300 targets nearly 600 km away which means that the system "can peer deep inside Pakistani territory and pick up aircraft as soon as they are airborne," the report said. "Deployed along the eastern border with China, the missile system can easily monitor fighter jets taking off from airfields along the Tibetan plateau." In the summer of 2017, India and China faced a 73-day military standoff on the Doklam plateau bordering Bhutan -- the longest such confrontation between the two countries in decades. The two sides agreed to improve communication earlier this year, but tensions have not dissipated.